Playwright Sherryl Melnyk after the staged reading of her new play Can’t Cross a Bridge. 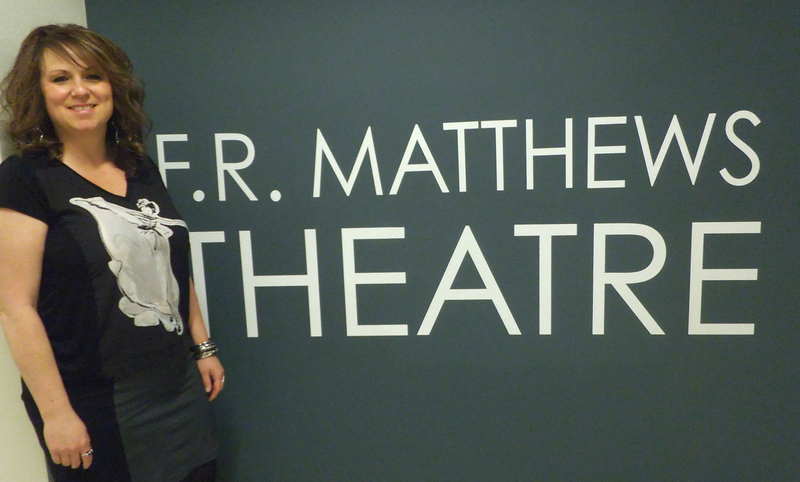 Sherryl Melnyk’s new play Can’t Cross a Bridge was read aloud publicly for the first time this Monday night at the University of Calgary’s F.R Matthews Theatre. The staged reading was presented by the School of Creative and Performing Arts’ Taking Flight: Festival of Student Work. But whereas much of the work in the annual student festival has been largely fictional, Melnyk’s play differs in that it is rooted in real women’s stories of abuse. Can’t Cross a Bridge tells the story of Velma and Lizzy, a mother and daughter estranged for 16 years. One day, a surprise call from the RCMP informs Velma that her daughter has returned. But hanging over their reunion are secrets from the past, painful secrets that Lizzy can no longer keep inside. Melnyk is completing her PhD in the Interdisciplinary Studies program, combining studies in English, Drama, and Women’s Studies/Sociology. Can’t Cross a Bridge is one component of her PhD dissertation. The first component, the social science component, saw Melnyk interviewing 21 women about their sexual histories. From that research, Melnyk chose three of the stories that she thought fit together the best, then synthesized them for the play. The last component comprised of theory, discussions around the creation of the work. Melnyk says her work is focused on bringing the arts and social sciences together, disseminating research through the arts as a means of creating meaningful dialogue surrounding social issues. And of course, her research could not have been possible without participants willing to share their lives openly with Melnyk. For Melnyk, the intimacy theatre grants between audiences and ideas is necessary for not only bridging the arts and social sciences, but also bringing these women’s stories to the community. Melnyk hands in her dissertation on April 24th, then defends it later next month. The staged reading of Sherryl Melnyk’s Can’t Cross a Bridge was presented by the School of Creative and Performing Arts’ Taking Flight: Festival of Student Work. The festival runs Mar 31 – Apr 11th, 2015.